The world’s population is rapidly growing older. The National Institute on Aging suggests that by 2050, 1.5 billion people will be aged 65 or over. High-income countries tend to have a larger proportion of older persons. However, less developed countries now have the most rapidly aging populations, making this a global challenge. The aging trend is also dramatically changing the ratio of older individuals to individuals under the age of 65. This is important because those in the profession of elderly care are generally under the age of 65. Considering these projections, it makes sense that some aspects of care might need to be outsourced to robots to alleviate the scarcity of human caregivers and provide a safer and healthier life for the elderly. Market demand to create robots that will care for baby boomers as they retire are well under way, and some are already commercially available. The development of sensors and devices that could monitor an individual, track health and activity, and signal if there is potential danger was already being considered as early as the early 90s. A simple bed sensor, for example, could detect if a person got out of bed during the night but did not get back in, prompting the need to check if everything was okay. The concept of the ‘smart home’–a wireless system of environmental sensors that provides information on a person’s movements and connects home devices and appliances–is a well-established concept now thanks to the “Internet of Things.” However, over the past couple years, assistive technology has become more sophisticated and elaborate. For instance, consider wheeled videoconferencing systems that can be piloted remotely, combining elements of a smart home with humanistic aspects of care that also include sensors for biometric tracking. The GiraffPlus Project was an EU-funded initiative that explored the use of this type of robotics with elderly people. It is believed to have had an impact on the future developments of social-care system in Europe. The Giraffe telepresence robot is now available for purchase. The robot can be combined with sensors placed around the home, imitating a person’s presence. Korean robotics company Yujin developed a robot called GoCart that is intended to deliver meals in elderly care facilities and hospitals. Yujin believes eventually its robots will be able to take over at meal times and free caregivers for other more important duties. GoCart is able to do delivery and recovery tasks, monitor the world around it with its simultaneous localization and mapping (SLAM) vision system and talk to other GoCarts. It is operated easily and gives patients great control over their environment. For instance, an individual can order snacks via their smartphone and have them delivered. GoCart can also call for an elevator and move between floors. Yujin advises that robots will be affordable, saving both time and money as well as becoming a viable option for many health-care institutions. In March 2017, the company announced they will be starting with demonstrations of the 2.2 version of their robot, which can also carry large items, such as linen or waste bags. If this initial testing is successful, mass commercial production is planned for end of the year. In the near future, robots won’t lend only a mechanical helping hand. Increasingly, they are being designed to also cater to people’s emotional needs and act as companions. In Japan, famous for its aging population and advanced robotics technology, a particular push was made to create communication robots for elderly with cognitive disabilities such as dementia. These robots can assist people with daily activities, medication adherence and scheduling, as well as provide some meaningful interaction. PARO (Daiwa House Industry), Pepper (SoftBank) and PARLO (Fujisoft) are some of the most famous communication robots available in Japan. PARO, a furry, seal-like robot programmed to bond with its owner and produce human-like emotions has been used as a therapeutic tool with people with autism and dementia. A study performed by Merel M. Jung and her colleagues at the University of Twente, Netherlands, showed that PARO had a positive effect on the well-being of patients with dementia. Care providers using the animal-like robot observed how it could stimulate communication and interrupt challenging behaviors. However, it was also noted that pet robots could sometimes overstimulate their users and were not appropriate for a broader group of older people, for instance, healthy people still living independently. In 2015, SoftBank launched the sale of Pepper–the world’s first robot that reads emotions and also generates its own based on facial expressions, words and surroundings. For example, Pepper is happy when he receives praise, and his emotions manifest visually through a heart display that changes different colors based on its mood. Do You Want a Robot to Look After You? Robots are increasingly becoming more humanized. Nonetheless, the question remains as to whether robots can really replace human caregivers. And moreover, would you want a non-human to look after you? Different objections have been raised, for example, robots might increase the feelings of objectification, loss of privacy and personal liberty, and infantilize older people. A systematic review published in the Journal of the American Medical Directors Association suggested that there is still a lack of evidence supporting the effectiveness of robots in health care. Also, opinions among the elderly appear divided, and their expectations and attitudes towards robotics are not fully understood yet. However, if a manpower shortage in the health-care industry continues, we might quickly become more grateful and accepting of artificial assistants to augment our care. Bemelmans R, Gelderblom GJ, Jonker P. Socially Assistive Robots in Elderly Care: A Systematic Review into Effects and Effectiveness. Journal of the American Medical Directors Association, 2012; 13(2): 114-120. Broadbent E, Stafford R, Macdonald B. Acceptance of Healthcare Robots for the Older Population: Review and Future Directions. International Journal of Social Robotics, 2009; 1:319. Sharkey A, Sharkey N. Granny and the robots. 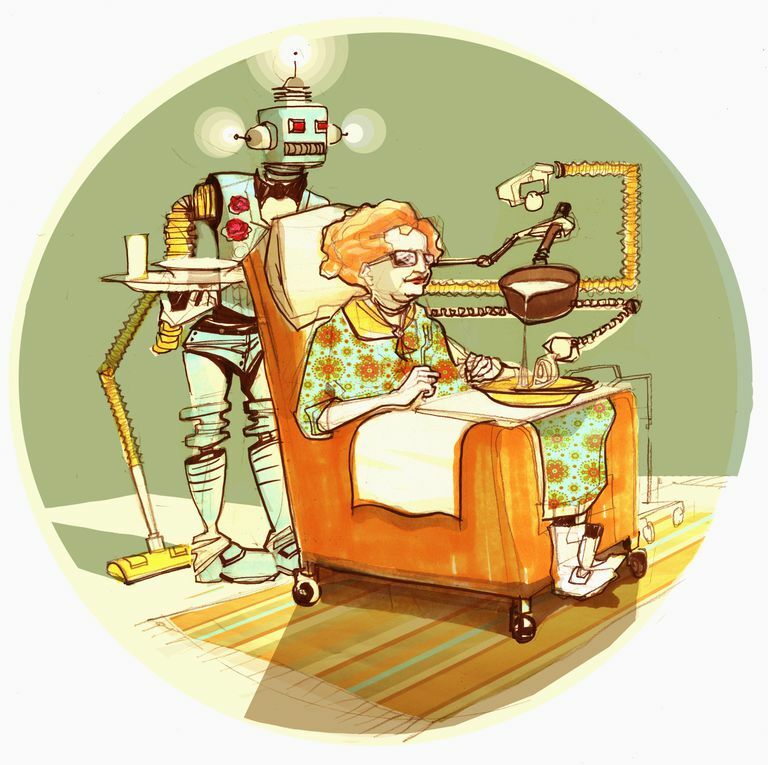 Ethical issues in robot care of the elderly. Ethics and Information Technology, 2012; 14(1): 27-40. Does the Paro Seal Have Actual Therapeutic Value?